Missing or rusted wall ties seriously compromise the stability of a building, a fact dramatically highlighted in a recent case of falling brickwork caused by cavity wall tie failure in Lancashire. 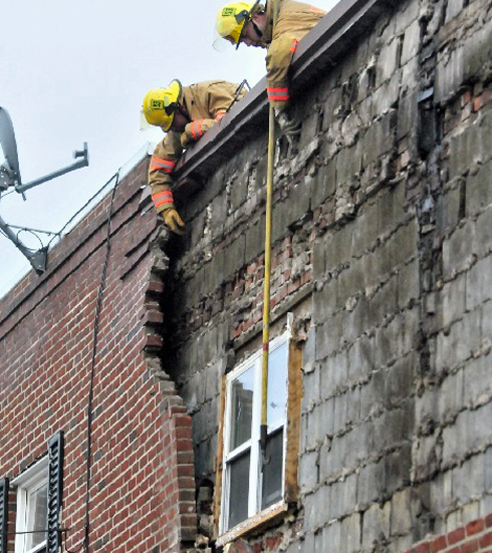 The outer brick walls of the buildings suffered a near-fatal collapse during a period of high winds of up to 70mph. A number of properties were damaged in the collapse, caused by high winds coupled with a serious lack of tie irons and with high levels of corrosion affecting the few cavity ties that were built into the wall during construction of the terraced houses. The fallen brickwork lay on the pavement next to the front wall of the houses, which were so compromised due to their neglected wall ties that they could not stand up to the onslaught of the wind. 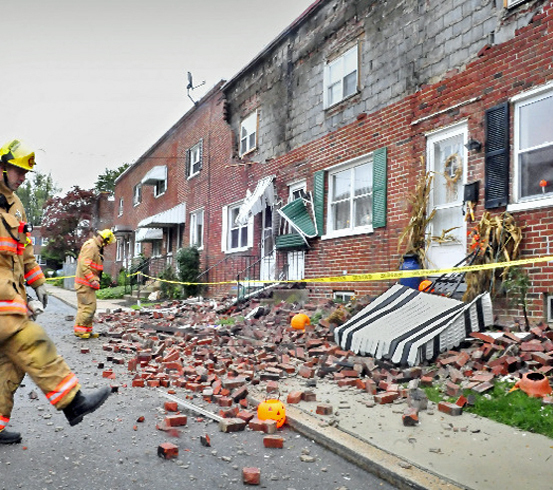 Wall tie failure is not a problem confined to the UK; collapsed walls that result from missing or rusted ties are a problem that regularly affects homes in countries as far apart as Holland, USA and Australia. Indeed anywhere where cavity walls are the traditional method of construction can be at risk of tie failure due to poor workmanship that leaves insufficient ties to resist wind loads or a natural aging process in which metal ties rust and loose strength. Twistfix are specialist suppliers of a full range of wall ties, including replacement wall ties, timber frame ties, masonry crack ties, wall starters and cavity wall ties for new construction. Our expert team are fully trained to assist in choosing exactly the right product and all of our wall ties comply strictly with every legal specifi­cation. 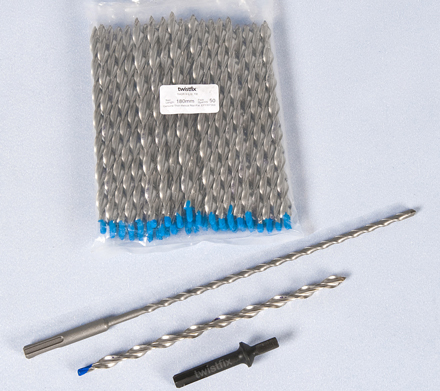 Popular among our range of wall ties is the 20m cavity wall tie installation kit, which centres on 50 stainless steel ties, a professional masonry drill bit and a clever low-cost setting tool. These 9mm helical ties are work-hardened and corkscrew easily into undersized pilot holes in block, brick or concrete, delivering a consistent undercut fixing. 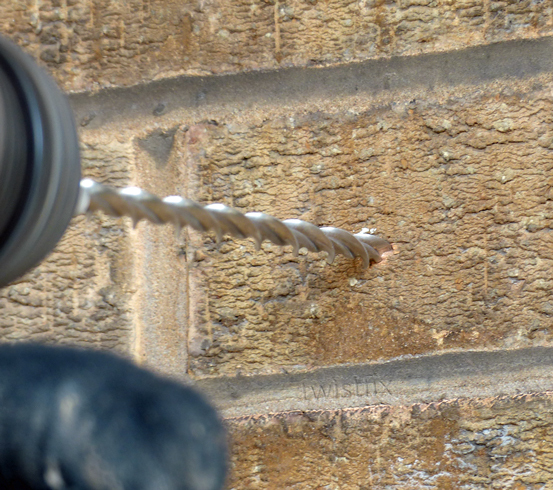 Quickly installed with a roto-hammer drill, this is without doubt the easiest and most cost-effective method of cavity wall tie replacement available today. With full CE Marking for new-build applications, these patented stainless steel wall ties are quick and easy to install, making them perfect for retrofit applications which strengthen cavity walls The ties can be supplied to suit most cavity widths. Please enjoy browsing our comprehensive collection of wall ties and call our experts on 0845 123 6006 or email sales@twistfix.co.uk for further advice and support.